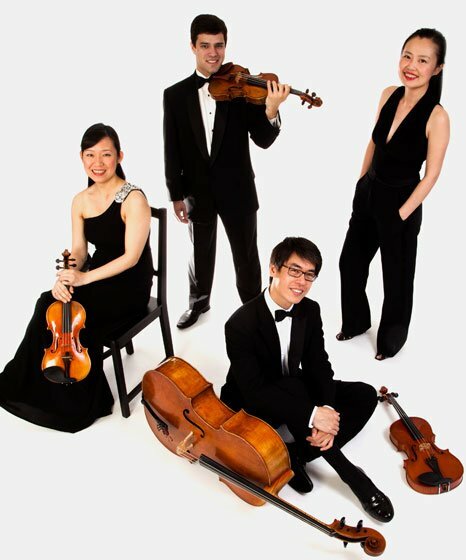 According to Rockport Music’s Artistic Director, David Deveau, the performance by the Vega Quartet on June 28th was the group’s first at the RCMF in eight years, thus its first at the Shalin Liu Performance Center. The quartet, which since 2006 has been in residence at Emory University in Atlanta, gave what appears to be its only program outside the South this year with some intriguingly experimental music by Haydn and Beethoven alongside two more or less recent pieces by native and immigrant American composers. In 2011, Domenic Salerni joined Jessica Shuang Wu, violin, Yinzi Kong, viola, and Guang Wang, cello as Vega’s new first violin. The foursome opened with Haydn’s Quartet in B minor, op. 33, no. 1, which is an unusual work not only because of the relatively rare-for-Haydn minor modality, but also for some formal peculiarities. The opening movement begins not in the tonic but in the relative major, D, which then modulates to the tonic. Moreover, like all the op. 33 quartets, this one has a designated scherzo rather than the typical minuet, which is here put in second position among the movements rather than third, notwithstanding that the first movement goes at a fairly quick pace (four of the six op. 33 quartets make this switch). Substantively, the quartet is a sort of echo of Haydn’s earlier “Sturm und Drang” works, though less angular in melodic construction. It is taut, compact and, despite some classically Haydnesque playfulness with keys and pauses, fairly grim. The performance by the Vega was a little tentative out of the box, but it quickly settled into a brisk and determined one, placing emphasis on dynamic contrast and the theatricality of the pauses. The distinctly unfunny scherzo’s sometimes surprising harmonic digressions elicited acknowledgment from the players mostly in their eyebrows, while the slow movement was played for delicacy, with notable success especially from Salerni. The finale got a relatively high-energy treatment, quite rightly, with Salerni making the most of his mini-cadenza near the end, though on the whole the Vega’s approach to the Haydn struck us as more Apollonian than might have been desirable. After the Haydn, Kong, who had been maintaining the stern and pouty demeanor of one who had just dined on lemons, got up to give a short talk on the two contemporary pieces to follow, David Kirkland Garner’s I ain’t broke (but I’m badly bent) and Zhou Long’s Song of the Ch’in. Well, not really: actually, at several points she clearly said that she didn’t want to talk about the pieces, and the audience should read the program notes or look these things up on the Internet. What she really wanted to talk about was how the quartet and other musicians work with contemporary composers, and what they like and what they don’t like. It turns out this speech is a bit of a set piece that they have taken on the road with them, the burden of which is that while they like to work with contemporary composers, they don’t want to play pieces that are, on the one hand, imitations of Beethoven and Brahms (“we already play Beethoven and Brahms, and these [modern] composers’ works aren’t as good, so why should we play them?”), or on the other hand, those pieces that call for extremes of oddball instrumental techniques for the sake of originality. Thus do performing musicians tyrannize mere composers who, after all, are only put on earth to come up with things for serious musicians to do. While Kong’s spiel was delivered for laughs (which it duly elicited), she also raised issues that deserve some response and, to some degree, rebuttal. First, there are some first-rate composers out there writing in “retro” styles—Easley Blackwood and Paul Moravec come instantly to mind—and, though these works might not be as good as Beethoven or Brahms, or Haydn or Mozart or Bach, they’re probably as good as, say, Gabriel Fauré, whose music gets played plenty despite not being as good as those other guys. If all we ever listened to were the Big Five, we’d get sick of them, too. Second, while it is undoubtedly true, as Kong said, that most new works (as they always have been) aren’t very good, and while the Vega Quartet and any other performing group or individual are entitled to their own tastes, it does not follow that those tastes are a substitute for the test of time to determine just what work actually was good (and even that test isn’t entirely reliable, as compositional styles go in and out of fashion like most other things—a generation ago people thought Mendelssohn was trivial and that no American composer before Ives was worth listening to). As gatekeepers for what the audience hears, performers should maintain a generous catholicity of taste and understand that they serve the music, not vice versa. OK, end sermon talkback. Garner, 30, was born in Atlanta but is now finishing a PhD at Duke in North Carolina. He has been fascinated with fiddle music, both of his native South and of the Scottish tradition represented in its homeland and in Cape Breton, Nova Scotia. I’m not broke… is a compact suite of 13 fiddle tunes (well, 12 actually, since one tune is used twice, though in very different settings) from both sources, played without pause and set with great imagination and variety (the title tune is the sixth track, er, movement). Some settings hew closely to the tunes, some don’t, some employ extended string techniques, gaudy coloristic effects, cluster and polytonal harmonies, and all the rest of the tricks at the disposal of the modern composer. It’s great fun and, in the end, a moving experience, full of both craft and passion. You also get to see and hear it in a performance the Vega gave last year, either directly on YouTube or as posted on the composer’s web site here. The performance Friday was, unsurprisingly, much like that one—colorful, joyful, secure and persuasive. The influx of distinguished composers from China to the US since the end of the Cultural Revolution is arguably the most important importation of cultural talent to this country since the Nazi refugees of the 1930s and 1940s. Zhou, who turns 60 on July 8th, won the 2011 Pulitzer Prize for the opera Madame White Snake. Like many of his cohort, he has sought to reflect on Chinese musical culture and embed its sounds in the idiom of contemporary Western music. Song of the Ch’in relates to the sound of the ch’in (in proper Pinyin, qin), a plucked zither whose range is pretty close to that of the entire string quartet, and its role as the traditional instrument of the educated classes. The work is quiet and spare, with classic bent pitches, gradually coalescing melodically in an episodic structure until the opening material is restated at the end. It tosses its ideas deftly around the quartet in keeping with its concept of a single instrument, and fades into wispy atmospherics. All the players contributed effectively. The post-intermission segment was given over to Beethoven’s Quartet No.13 in B-flat Major, Op. 130, one of the most innovative, perplexing and frustrating works ever created for the quartet medium. As with all Beethoven’s late quartets, this one exploits radical disparities to fuse a higher unity. While not as knotty as the c-sharp minor quartet that followed it, it furrows the brows of performers and commentators for its wide-ranging six movements, the fifth of which Beethoven described as a movement that brought tears to even his eyes. The big problem about it, of course, is what to do about the finale, beginning with which finale to use. The original one was the Große Fuge, definitely the grandest fugue to come out of the 19th century, and eventually published separately. While the first five movements are all full of greatness, in spirit they simply do not prepare one for the emotional and technical complexity of that fugue. Thus, Beethoven was reluctantly persuaded to come up with something peppier and lighter, the resulting finale being the last significant composition Beethoven finished (it was premiered a month after his death). The problem with that finale is that it might be considered too light for what preceded it, especially the gentle cavatina fifth movement. The performers are thus left with an unenviable choice that calls for utmost discretion in presentation in either case to integrate the finale to the rest of the work. On Friday, the Vega went with the “final” version. The best thing about the Vega’s performance of the Beethoven was that the players appeared to have unfurrowed their brows and played it as if it were a piece of music rather than a philosophical problem. Good on ya, mates. They adopted a rich, smooth and sonorous sound for the first movement introduction, and a robust, no-nonsense main body of the movement punctuated by languorous irruptions. As in the Haydn, their use of dynamic contrast was effective. We especially liked Wang’s crisp articulation. The second movement seethed with suppressed fury, the third—the first of the two slow(er) movements—was elegant and poised, but warmly communicative. The “German dance” fourth movement was a lovely sentimental waltz more than a traditional alla tedesca, and while the fifth movement was touching, its sublimity continues to elude us, especially in comparison to the slow movement of the Ninth Symphony. So that leaves the finale, which while not utterly anticlimactic, seemed oddly a little too contained and craftsmanlike; it could have done with a larger dose of the bug-eyed frenzy that often accompanies performances of that fugue. HA! Miss Kong really pushed this guy’s buttons!